Our Staff | Richard C. Annis, O.D. Staff members at Richard C. Annis, O.D. are well trained in their field of expertise and attend continuing education classes throughout the year. This creates an office culture designed for excellent patient care and personalized service. I have called the Saugatuck-Douglas area home for most of my 55+ years. I graduated from SHS (Saugatuck High School) in 1980 and moved away briefly before returning in 1983. There's "no place like home" and I am here to stay! In 1986, Dr. Annis bought the practice from the previous doctor, who I was working for, and that is where my story and optical career really began. What was a part-time job turned into full time and a great adventure! 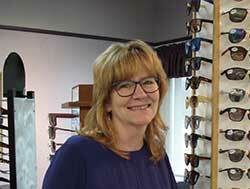 After over 30 years in the optical industry, I still get excited about new frame styles and new technology. The patients we see, year after year, have become more like family. And the opportunity to meet new people keeps the job interesting. When I am not at work, you can find me in my flower garden, on the golf course or just enjoying the wonderful area we live in. My partner embarked on a new adventure 3 years ago and is growing hops, which has added new fun and challenges to our lives. The "kids" are all grown and busy with their lives. We have one at home still, working on his degree at Grand Valley and working at Marro's in the summer. All in all - life is good. "Every day is a gift." You'll see that sign hanging behind my desk in our office and I truly believe that. My optical career started quite by chance in 1993. 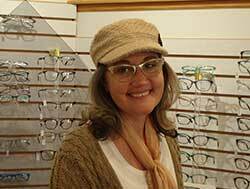 By about the 10 year mark, working at an optical chain store, I realized I wanted to help patients with my knowledge and experience in a more complete way. I no longer wanted to just "sell glasses." There's more to this profession and I wanted to grow. Shortly thereafter, my resume and cover letter landed on Dr. Annis' desk, and even though he wasn't actually looking to add to his staff, he called me in for an interview. I told him all the reasons why he needed me and he bought it... hook, line and sinker (at least that's how I role-played it in my head). This small-town practice truly is the perfect place for me. I've gained so much more reputable experience, and I adore the clientele. Also, working alongside my very good friends every day couldn't be any more fun! Outside of the office I spend time with my best friend and husband, Tom, at our home at Gun Lake. Together, we've done our best to raise three grown children, who continue to impress us as young adults. Since we now have an empty nest, we're able to enjoy time camping, boating and gardening. I also spend a lot of time in the kitchen cooking for our family and friends. God is always reminding us of how short and precious our existence is, so we spend every moment "Livin' Life" to the fullest. 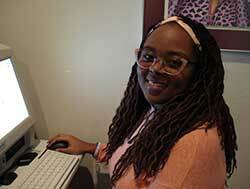 I am the newest addition to Dr. Annis' office and my role here is an Optometric Assistant. What that means is I'll be doing all of your pre-testing prior to your exam with Dr. Annis. I was born and raised in South Haven where I currently still reside. I graduated from South Haven High School in 2011 and I can't believe it has been that long. It seems like it was just yesterday! Before working for Dr. Annis I was a patient here for many years and have always loved coming here. I have been wearing glasses since I was about 10 years old and I can honestly say he is one of the best eye doctors that I have been to. Prior to working in this office, I worked at a call center where the environment was much different. My optical career began after one of my exams here. The staff loved my friendly, outgoing personality and decided to welcome me onboard! Working in this office is something that I love doing but never expected. I was a bit nervous because I knew it would be challenging at first since it was not something that I am used to doing, but it was an opportunity that I could not pass up since I am always ready for a new challenge. Besides, they taught me everything that I know so I couldn't be more thankful. I call it a "blessing" to be able to work here. Most importantly, they treat me like family rather than just another employee.